[Arshad Pathan] let us know about his latest project, a modular code lock that can be adapted to many different situations. The user interface is made up of a character LCD screen and a 3×4 keypad. 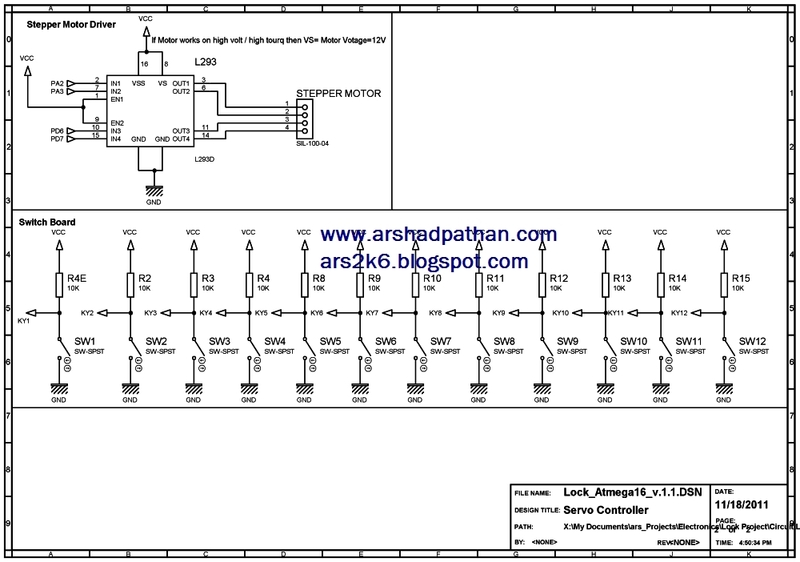 For this example [Arshad] is using a stepper motor as the locking mechanism. When the board is first powered up it runs the stepper in one direction until receiving input from a limiting switch. 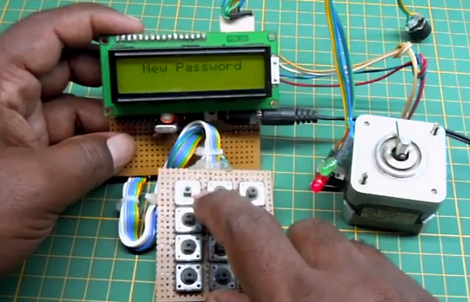 In this way, the microcontroller calibrates itself to ensure the lock is in a known position. From there it waits for user input. An unlocked door can be locked at any time by pressing the * key. Unlocking requires entry of the correct password. And a password can be changed by entering 9999 (followed by the old password when prompted). In the video after the break [Arshad] does a great job of demonstrating the various modes which he has programmed. This stands on its own, but we always love to have more details so we’ve asked if [Arshad] is willing to share a schematic and the source code. We’ll update this post if we hear back from him. 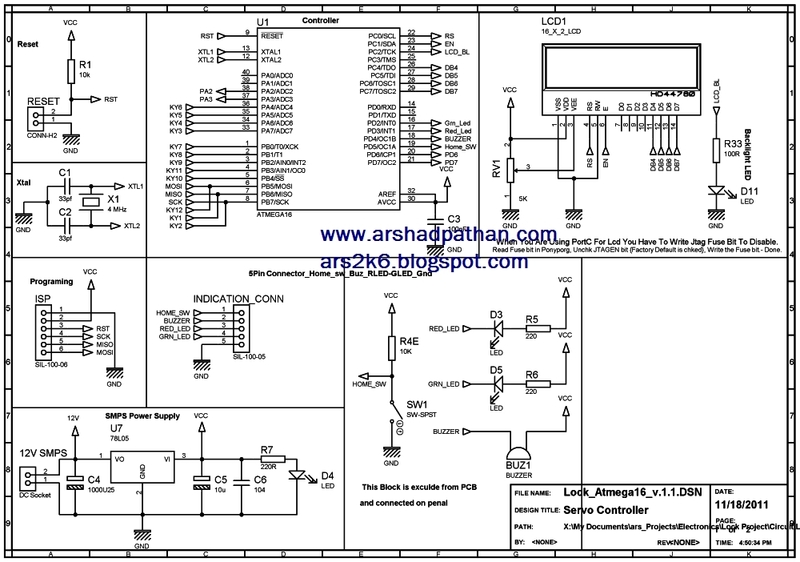 Update: [Arshad] sent in a couple of schematics which can be found after the break. WOW you have 3 hands! WOW! he has 3 hands? Put it in a nice package and you’ll sell them like hotcakes in this paranoid era. Kudos for reusing a Braun charger for power and for using the the third hand! Nice work. Never thought of using a stepper motor to work the latch. Like the fact you use a limit switch to detect home. Which I assume is the locked position. I would suggest changing what is displayed when entering in the password to unlock, just some character to represent that a number has been enter. For example “*” for each digit entered. This would make it harder for someone watching to see the password. When entering a new password, I would think displaying it would be fine. OMG! He has three hands! Apart from this there is nothing interesting in the video. very nice work….one thing i don’t get in electronic locking doors is what happens if perhaps the motor fails….what can be done as backup solution? because using a regular keylock as backup would cancel the security….any thoughts? As a backup you could open up the unit and power the motor with an external power supply assuming you have access to the motor and it is not on the otherside of your bedroom door. To prevent another hacker from doing this secure your locking unit with secuirity screws. i think we have to add some mechanical system with this digital system, so user can also unlock the door by physical key..
this both system will works parallel. What happens if you change the password to 9999? ooh yes, there is a bug..
i have to change something, or there is a limitation you can’t change password to 9999, if you have any good option i can implement it..